During the late 1970s/early 1980s a handful of Italian directors unleashed a spate of cannibal films (including the infamous Cannibal Holocaust) most of which were promptly banned as ‘Video Nasties’ in 1984. Despite being firmly exploitation cinema, they had a surprising power as ‘the noble savage’ took revenge on the white colonialists pillaging their land. 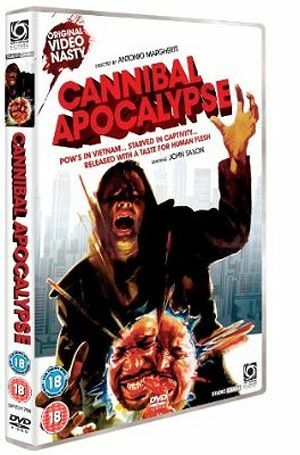 Antonio Margheriti, however, eschews the traditional rainforest setting, moving the action in Apocalypse to an urban cityscape, starting in the jungles of Vietnam before quickly moving to Atlanta as genre favourite John Saxon fights the urge to give in to ‘contagious cannibalism’ picked up from two marines he rescued during the war. Spreading like a disease (using many of the conventions popularised by zombie cinema) there’s the requisite dose of flesh eating and gore, mixing deranged Vietnam vets with gut munching cannibalism. Firmly entertaining but not the best entry in this notorious subgenre. Limited extras.